The BAT to Outlook Migration Tool! I have purchased the subscription of The Bat! Profesional Email Client last week. It takes me one day to set up my pop account on it. I worked on it 5 days and experienced that its user interface is so complex that you have to spend more time for minor changes. I found it more secure therefore I choose but now I want to migrate The Bat to Outlook with complete data. As the file formats for both email clients are different then How can I migrate to Outlook? Can Migrate Selective Emails to Outlook? Does the software capable of removing duplicate email items? What is the pre-requisite to use software on Windows Platform? Does it maintain data integrity of data during migration? Can I Export The Bat! data in batch to outlook? What is the average time to migrate 5 GB of data? 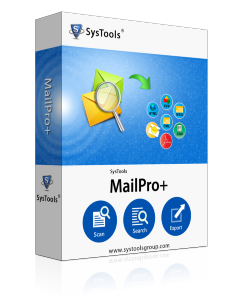 There are certain things that you have to take care while choosing mail client for your use. Ease of use is the first & foremost thing that should be taken care off. If this factor is not taken care off then you might have to face certain problems in future such as in present scenario. But you do not need to panic because there is a professional solution available which can resolve your problem easily. One of such high quality and specially built software is Bat to Outlook Migration tool. It has the capability to resolve your problems in the limited span of time. Using this tool you can perform selective migration of Bat emails to outlook. It provides the functionality to exclude the duplicates emails and batch migration of Bat to Outlook. There is pre-requisite exists for using the software on windows platform. The time taken to migrate 5GB of data depends on the condition of Bat mailbox data. Does the software put aside any limitation of the amount of data that can be migrated to Outlook? No, a user does not have to install Outlook for exporting data from The BAT to Outlook. However, to open and view the migrated files you need to have Outlook. Do I have to install Outlook on the machine for carrying out migration? No, it is not compatible with Mac Operating system. This utility is a Windows based application. "Having several crucial email data saved in The BAT, I was looking out for a convenient approach to migrate from the bat to outlook. Then I came across your product The BAT to Outlook migration application. The tool performs migration of data without involving any data loss. I am deeply impressed by its working. 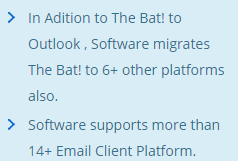 The BAT to Outlook migration tool has been an amazing product to resolve all my concerns regarding the migration of data from The BAT to Outlook. It has given me the confidence to export data to Outlook without fearing about the integrity of data during the migration procedure. The Bat Email Client have major security enhancements than any other email client exists but it is more complex than another email client of same features. Its layout is like the old windows XP interface. You have to perform more google research while trying to change the layout using inbuilt enhancement settings. Therefore to migrate from The Bat email client to Outlook you need a professional solution.